This page contains easter eggs for the disc Sleepaway Camp Survival Kit (DVD, Region 1). 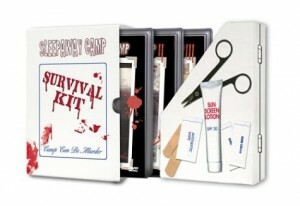 In the Sleepaway Camp Survival Kit set, on the Sleepaway Camp 3 disk, go to the "Extras" screen and when "Commentary" is lit, press your Up button. The "camp new horizons" logo on Angela's shirt will light up…this will lead to a really old newscast bit on the movie.